Ash Global Benefits is proud to test our new review application. We look forward to reading the responses from each of our clients as well as viewing the great photos of our valued customers. We are providing an opportunity for everyone of our clients to share their experience, so we can continue to provide an outstanding experience. Thank you for your comments. You’re finally on vacation the one you’ve been planning for months maybe years and of course you get sick preventing you from flying to your next destination what do you do? If you didn’t buy travel insurance you get on the plane and risk blowing our eardrums out and have a miserable time OR if you bought travel insurance you call the number on your ID card see a doctor, get well and get on with your trip. If you called me for consultation I put you with right plan you have access to the best care, it can cost you nothing and you get reimbursed for any losses for missed flights and hotels. There’s a lot that can go wrong when you travel. You can get sick, even if you’re usually very healthy. You can lose your passport, your flight can be cancelled, random moped accident, or your luggage lost indefinitely and hurricanes will definitely put a damper on your fun. There’s so much that’s out of your control on a trip, and you usually don’t realize it until it’s too late. The best thing you can do is take control by investing in travel insurance. The truth is that insurance is priceless. You may be indifferent if you don’t have to use it and everything goes fine. But, if something does go wrong, you’ll never regret that you bought it. It could be the one thing that saves your life and if the accident doesn’t kill you the bills will. Ash Global Benefits is known for “Providing Peace of Mind Worldwide”. 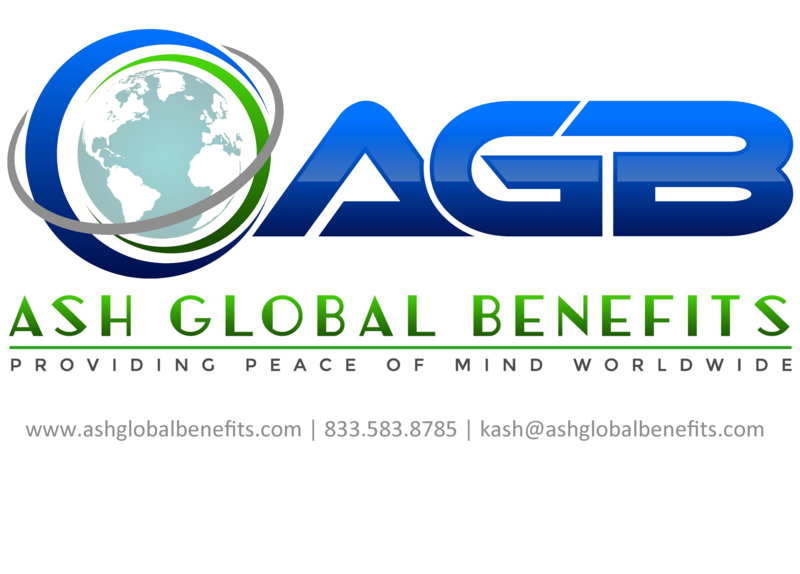 Ash Global Benefits (AGB) specializes in insurance plans for travel, long term expat assignments, foreign nationals coming to the U.S., natural disaster, political evacuation, terrorism, high risk coverage, lost baggage, accidental death and dismemberment, repatriation of mortal remains, J1 Visa, F1 Visa, Schengen, Adventure Sports, medical travel and or tourism just to name a few. AGB’s Founder, Kristin Ash is in a league of her own providing individual attention to all of her clients whether it is a church mission trip, corporate employees or individuals. Ash treats every client as if they were her own family. She listens to their concerns and evaluates the risks carefully. From finding the right protection to have peace of mind when tragedy strikes to education on risk mitigation no one is better. When employees and volunteers travel abroad, ensuring their safety is crucial. This practice is called Duty of Care, and it refers to keeping your team safe, no matter where they go. It means that businesses should take all possible measures to safeguard the health, safety, and wellbeing of employees and volunteers who are traveling for business reasons. Beyond a legal obligation, duty of care is an integral part of demonstrating your commitment to your team and building trust. AGB will customize the perfect plan helping you choose the benefits your team needs from their suite of options. No matter what your insurance needs are, contact Ash Global Benefits at (833) 583-8785 or email kash@ashglobalbenefits.com. You can also find more information at www.ashglobalbenefits.com.